See elephants painted with bright patterns for an annual festival. Find out how traditional pottery is made and see lots of colourful examples. See elaborate costumes worn by people at an Indian wedding. Find fascinating facts about India. 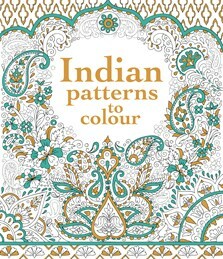 A stunning colouring book featuring intricate patterns taken from traditional Indian textiles, ceramics and architecture. Provides a unique introduction to the history of decorative arts in India, with snippets of information about the images, colours and motifs found in Indian art. Art-lovers of all ages will find this a fascinating book, and colouring in the delicate designs is a therapeutic pastime. Thick, craft-quality paper is perfect for coloured pencils, felt-tip pens or watercolour paints.